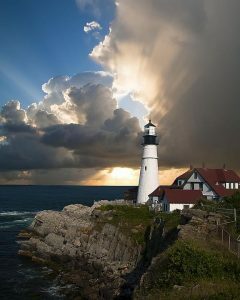 Lighthouses have long held a fascination for many people, me included. Perhaps it’s to do with the analogy between the wild seas and the shining beacon and staidness that a lighthouse offers; the fact that many lighthouses may have started out in the era of exploration as nothing more than a pile of wood built on the highest point of a promontory, but due to their importance, they were then built to withstand centuries of wild seas and inclement weather or because they signify safety in a wild, watery world. It could also be because that there’s a dichotomy between the illusion of safety of a lighthouse and those terrible dark days when smugglers and the like used to light false beacons to lure trade ships onto rocky shores so they could pilfer the contents. Fastnet Rock Lighthouse, Ireland. The elegant and beautifully waisted tower structure was designed by William Douglass, an engineer with Irish Lights, and was built from coarse-grained Cornish granite apparently came from the Cheeseswring quarry on Bodmin Moor. Over 2,000 blocks were cut and shaped to interlock one into another. 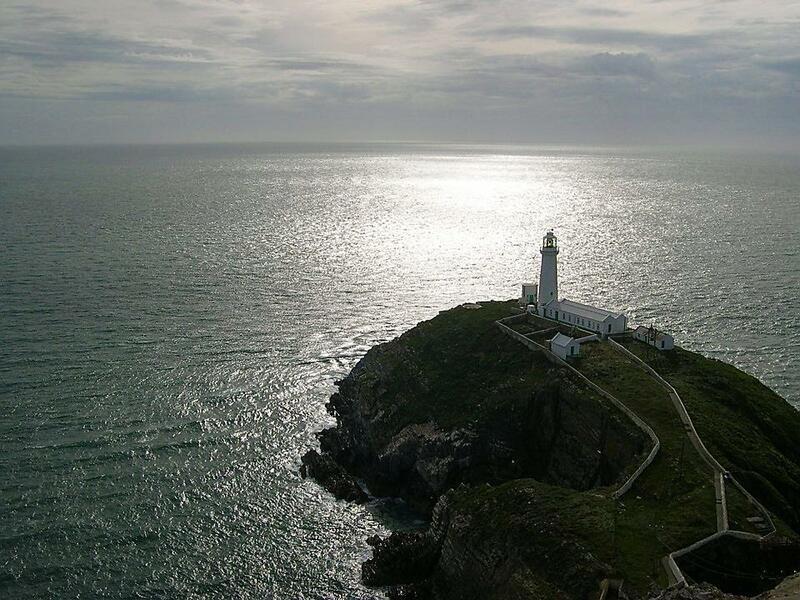 Whiteford Lighthouse, South Wales is the only cast-iron lighthouse in Britain which is wave-washed, although it can be reached on foot at low tide. Bell Rock Lighthouse, Scotland – The world’s oldest surviving sea-washed lighthouse was built on the Bell Rock, 11 miles from the shoreline. First lit in 1811, it stands 35 metres tall and its light is visible from 35 statute miles inland. The challenges faced in the building of the lighthouse have led to it being described as one of the Seven Wonders of the Industrial World. The Eddystone Lighthouse, England is on the dangerous Eddystone Rocks, 9 statute miles south of Rame Head. The current structure is the fourth to be built on the site. The first and second were destroyed by storm and fire. The third, also known as Smeaton’s Tower, is the best known because of its influence on lighthouse design and its importance in the development of concrete for building. “What does a lighthouse do? I ask myself. It never moves. It cannot hike up its rocky skirt and dash into the ocean to rescue the foundering ship. It cannot calm the waters or clear the shoals. It can only cast light into the darkness. It can only point the way. Yet, through one lighthouse, you guide many ships. Show this old lighthouse the way.” – Lisa Wingate, The Prayer Box.